Choose to receive pre-printed contribution envelopes for the offertory. Detailed statements are available to any registered parishioner who requests one at any time. You can easily see what you have contributed to the various collections. Registration is necessary for enrollment in RCIA and Religious Education and to be baptized, receive First Communion and Confirmation. If you are asked to be a Godparent or Confirmation sponsor to someone in another parish, your information on file with Blessed Sacrament Catholic Parish can be easily provided. 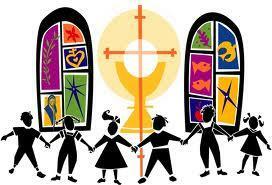 You will enjoy a real sense of belonging -- a chance to become a member of our Blessed Sacrament Church "Family." There are registration forms in the back of the church, in the parish office or you can download the PDF forms Mail your completed registration to Blessed Sacrament Church, 5135 N. Cocoa Blvd, Cocoa, FL 32927, you can also upload it to secretary@blessedsacramentcocoa.org or seal it in an envelope and place it in the Sunday collection basket. All information is kept confidential.